They announced it on April Fools Day, but it's no joke: The bumbling former fireplace salesman with no military experience Theresa May has put in charge of our armed forces is plotting to militarise schools in deprived neighbourhoods. 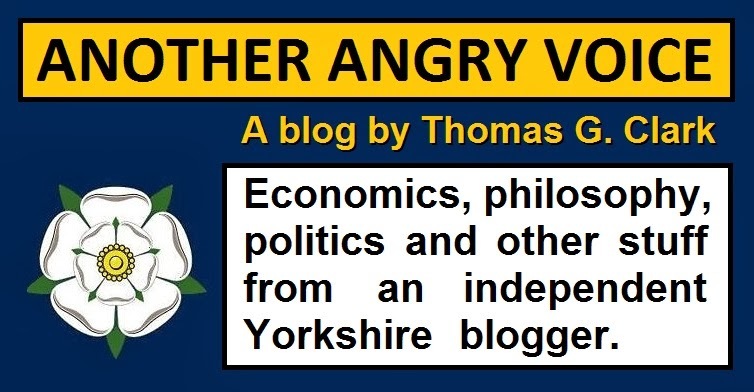 For the last eight years the Tories have been routinely ignoring teachers and education experts who have argued that better funding and more modern teaching methods are fundamental to an education system that is capable of producing adults with the skills and aptitude to cope with the rapidly changing modern work environment. The Tories ignored them in order to concentrate on their ideological agenda of giving away thousands of state schools, for free, to unaccountable private sector pseudo-charities (many of them owned and operated by major Tory donors), reverting to old fashioned rote learning methods, and then inflicting the largest cuts to the education budget in decades. It's not just teachers and education experts who have been complaining about the devastating impact of extreme Tory budget cuts. Generals have furiously condemned the Tories for slashing the armed forces leaving them "unfit for purpose". 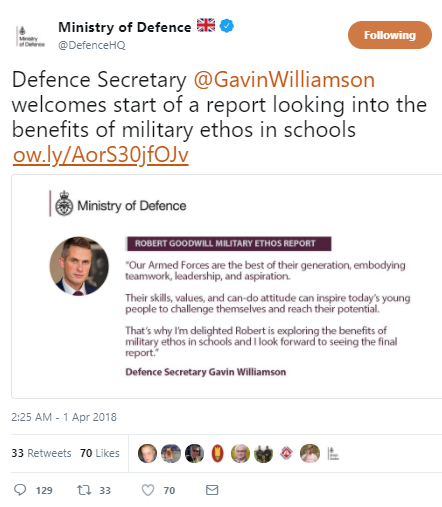 But instead of announcing an end to the ideologically driven austerity cuts to the armed forces, Gavin Williamson and his Tory pal Robert Goodwill are concocting an extraordinary plot to introduce special "military schools" in deprived areas in order to create a new generation of cannon fodder kids. Anyone who is familiar with the rise of fascism should be deeply concerned about the concept of indoctrinating school children with the "military ethos". If parents actually want their kids to develop the military ethos, there are plenty of cadet organisations for them to sign them up to. It hardly seems like a controversial concept, but the classroom should be a place for education, and cadet organisations should be places for developing the military ethos. 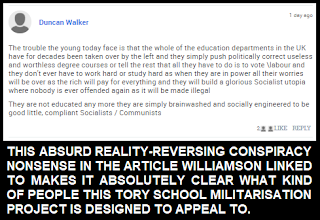 Another extraordinary facet of the announcement of this Tory school militarisation project is that the link didn't go to an official government press release, it went to an article in Rupert Murdoch's right-wing propaganda rag The S*n! Not only did Gavin Williamson use the official Ministry of Defence social media account to provide free publicity for The S*n, the comments underneath the S*n article made it perfectly clear the kind of people this policy is aimed at. Here's a quote from one of the comments that Williamson decided to promote via the official Ministry of Defence Twitter account: "the whole of the education departments in the UK have for decades been taken over by the left". So when the reality is that since 2010 huge swathes of the education system have been given away to private sector interests (including unelected Tory lords and major Tory donors like Robert Harris and John Nash) but Williamson is using the official MoD Twitter account to help spread the ludicrous reality-reversing conspiracy that the whole of the education system has somehow been taken over by the left! 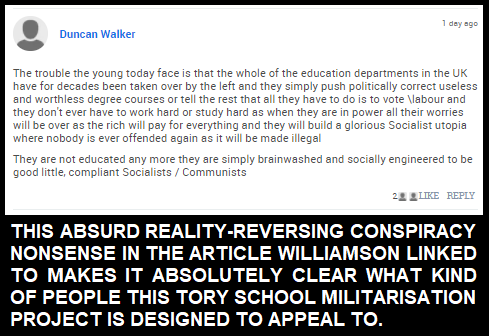 The idea of turning schools in deprived neighbourhoods into military indoctrination centres in order to create new generations of cannon fodder is grotesque in its own right, but the decision to use an official MoD social media account to give free publicity to The S*n and a slew of bizarre below-the-line right-wing conspiracy theory nonsense is even worse. 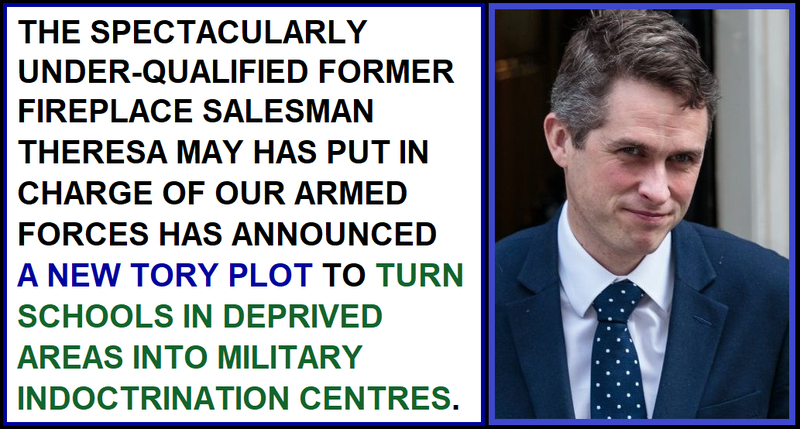 It's nothing short of politicisation of the armed forces in order to spread blatant pro-Tory propaganda. When is the march against Tory anti-Semitism? What is a Corbyn's hat distraction tactic?